Ranch Sorting National Championships Announces Official Partner Alliance with the American Quarter Horse Association (AQHA), RSNC Ranch Sorting a new event at Battle in the Saddle and new location for 2012 Merial RSNC National Finals. Exciting news for ALL RSNC members wishing to earn AQHA points on their Quarter Horse! With the new Partner Alliance with AQHA, producers can now co-sanction the Open and Youth Divisions. This will give contestants the opportunity to qualify and earn points in both associations in the same class. Starting January 1, 2012, with sanctioning approval from both associations, producers can now offer a RSNC All Levels Class and those wishing to earn AQHA points can designate their AQHA team to earn AQHA points at the same time. The AQHA Amateur class must be separate but the same co-sanctioning opportunity exists for the Youth class. The one minute time limit of the 1st round will determine the AQHA placing and the second or consecutive rounds will determine the RSNC placing. This allows the producer to draw contestants from both organizations and allows contestants to save money while qualifying for the huge payouts at the RSNC National Finals and the AQHA World Show Finals. Until rules are unified AQHA rules will be followed on co-sanctioned classes. AQHA does have 120 day application deadline so be sure to plan now and contact AQHA 806-376-4811 or email Lisa Pond at LPond@aqha.org to request Special Event Application. With AQHA Partner Alliance Status the 4 RSNC Regional Super Sorts and RSNC National Finals will be Double AQHA point classes giving everyone a huge head start on their qualification process. This is a win/win for all involved and especially for the sport of Ranch Sorting. If you have questions, contact the RSNC office at: info@rsnc.us or call 970-897-2901. Battle in the Saddle is owned by Oklahoma State Fair and managed by the American Quarter Horse Association. Last year’s Battle in the Saddle was held July 5-9 in Oklahoma City and featured more than $130,000 in added money and an estimated $300,000 in purses. For 2012, RSNC Ranch Sorting will be joining the exciting line up of events of cutting, roping, ranch remuda with more events to be announced soon. 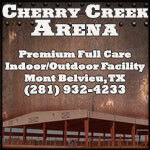 Another great bonus, RFD-TV will be there to highlight the sport of Ranch Sorting. Battle in the Saddle welcomes ALL breeds, but American Quarter Horses competing will receive AQHA points. This year, July 3-10, 2012, Merial RSNC National Finals will be held in conjunction with Battle in The Saddle at the Oklahoma State Fairgrounds in Oklahoma City, OK. Last year June 27-July 2, in Ardmore, Oklahoma, at the Hardy Murphy Coliseum, RSNC had 4,093 teams participate over 6 fun-filled days. During the 2011 National Finals our membership was at 11,000, since then membership has grown to 14,000 members. This sport continues to explode all across the United States. RSNC has great events planned for 2012, RSNC Regional Events, AQHA co-sanctioned events, Battle in the Saddle, shows with Cotton Rosser and much more. Make sure to stay up to date with RSNC by signing up for FREE Membership, visit RSNC on Facebook, Twitter and YouTube. RSNC and RSNC Producers strive to offer the best possible riding experience and competition to members. Join RSNC and be a part of the #1 Equine Family Sport!